Nakd Cashew Cookie nut bar is delicious and nourishing with a soft, moist texture. It's super tasty too; imagine a handful of crunchy nuts and juicy dates blended into something smooth that melts in the mouth. Made with just cashews and dates, there are no sugary syrups or artificial preservatives – just fruits and nuts, happily smooshed together into a handy bar. This makes it a snack that’s simple and wholesome – the way nature intended! 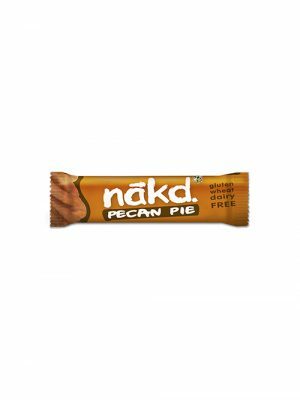 Our Nakd Pecan Pie snack bar is packed with good stuff to keep your body full of the energy and nutrients it needs. Bursting with flavour, it has a tantalisingly nutty taste and a soft, yummy texture which doesn’t melt or get sticky like other bars do. That’s because only the most delicious, natural ingredients make it into a Pecan Pie bar, leaving you with nothing but guilt-free goodness.